The Boston Globe‘s Regional Editor sent me a link to a report in his paper about the new gorilla exhibit that will be opening up over the Frankin Park Zoo. I thought that some of our visitors who live in that area maybe interested in this news. If you can visit and take some pictures, please do and share them with us. The whole purpose for this renovation was because several of their gorillas escaped. Specifically, if you don’t remember, around three years ago, Little Joe, a gorilla, broke out of the Franklin Park Zoo and attacked a 2-year-old girl. This new exhibit is in response to that escape, which features glass-walled barrier that will let him see his public again — but prevent another escape. 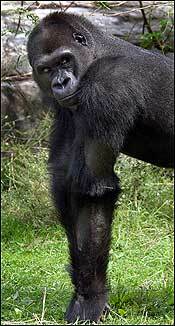 other gorillas so nice as well. God Bless them.